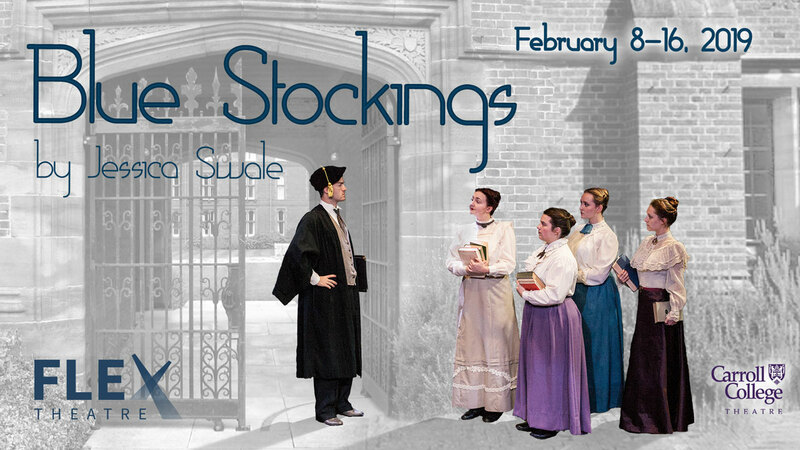 HELENA – Carroll College Theatre is producing the play Blue Stockings by Jessica Swale. This show will run February 8–16 in the FLEX Theatre in the lower level of the Carroll College Campus Center. The first show of 2019 is a moving play about the first women to attend classes at Cambridge as part of their education at Girton College in 1896. “Blue Stocking” is a derogatory term for an intellectual woman used commonly in the late nineteenth century before women were considered fit for college education. In this play, a group of talented young women attending Girton College campaign to be allowed to attain formal degrees, along with their male colleagues, after passing the Tripos exams. The play takes place in England, amidst a backdrop of the rise of feminist ideas such as equal education, voting rights for women, and female bicycle riding. The women of Girton College must decide if they want to abandon education in order to be accepted within society and have a chance of love and a family, or continue schooling and risk ending up being branded as “Blue Stockings” without hope of employment or marriage. Shows will be at 7:30 p.m. on February 8, 9, 14, 15 and 16. There is one matinee on February 10 at 2:30 p.m. Parking is free in the Campus Center lot off of Lyndale for all performances. The theatre is fully ADA accessible through the east entrance of the Campus Center. Tickets are available at the door or online. Tickets are $15 for general admission, $10 for students and seniors, $5 for children 12 and younger, and $5 with a current Carroll College ID.